Former Councilman Michael A. Nutter said Tom Knox's television ad campaign exaggerated Knox's role in former Mayor Ed Rendell's administration. Tom Knox's opponents took their bashing campaign into the streets yesterday. U.S. Rep. Bob Brady ripped Democratic mayoral rival Knox for having owned a health insurance firm that once told its subscribers to seek permission before visiting an emergency room. Brady was just 44 seconds into a news conference about Philadelphia's emergency medical services when he changed the subject. "I was outraged by Tom Knox putting the bottom line ahead of helping people," Brady said as he stood in front of the Engine 43 firehouse on Market Street. It was the opening salvo on a day when three candidates in the May 15 Democratic primary amped up their public attacks on Knox, the front-runner. Two have already launched TV ads criticizing him directly or indirectly. State Rep. Dwight Evans said Knox had no record on the top issue of the day - crime - and former Councilman Michael A. Nutter said Knox was using his multimillion-dollar TV ad campaign to exaggerate his role as a deputy mayor during the Rendell administration. Josh Morrow, Knox's campaign manager, dismissed all three critiques yesterday as the work of "desperate" politicians. "They're afraid of Tom Knox the mayor because they know when this guy is elected, the status quo and the way this machine is run is over," Morrow said. Trying to underscore his point, Evans summoned reporters to the front of the Wendy's restaurant at 15th and Chestnut Streets in Center City to toss the 1984-era zinger, "Where's the beef?" From a white paper bag, the veteran legislator pulled out a handful of what looked to be foil-wrapped burgers. Inside the wrappers were beefless buns. "So in this case we ask, 'Where's the record?' " Evans said, in self-conscious parody of the Wendy's slogan that Walter Mondale once used to skewer fellow Democrat Gary Hart in a 1984 presidential primary debate. As Evans spoke, aides held two small posters. One listed 10 Evans accomplishments on public safety under a picture of a juicy double burger and the heading, "Dwight's Beefy Record on Fighting Crime." The other poster, labeled "Tom Knox's public safety record," had a picture of a sandwich from which the beef had been removed, along with this lone entry: "Circulated a petition to support a gun-control bill that Dwight Evans authored . . . "
That was a reference to last year, when Knox collected 80,000 signatures in favor of stricter gun control in the city and presented them to lawmakers in Harrisburg during a special session on crime. Evans, a longtime advocate of tougher gun curbs in the city, was a prime sponsor of that session. Polling last in the five-way race for the Democratic nomination, Evans said Knox "really doesn't have a record," but is "attempting to create one" through TV advertising. Though Evans had stood shoulder-to-shoulder with Knox three weeks ago to challenge Brady's candidacy for failing to file require financial disclosure data, he said he was not being inconsistent by attacking Knox now - because "Brady was wrong" then and "Knox is wrong now." 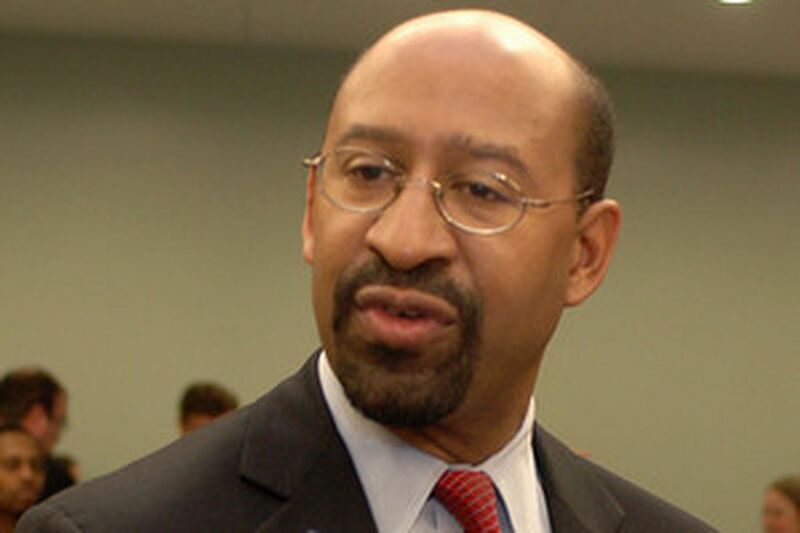 Evans also scoffed at Knox's short employment in the Rendell administration: "I think it was for 15 seconds." Asked whether he meant to call Knox's ad claims fraudulent, Evans paused before saying they were, "deceiving . . . distorting and distressing. Enough is enough." Meanwhile, at a news conference to celebrate his endorsement by Philadelphia Magazine, Nutter joined in the criticism of Knox, contending there was a gap between his television portrayal and his actual role as a deputy mayor in 1992 and 1993, under then-Mayor Rendell. "He's got a TV record, I've got a public record – that's what we're dealing with," Nutter said. In his ads, Knox, who served Rendell as $1-a-year deputy mayor for management and productivity, has taken some credit for helping Rendell balance a city budget that was deep in deficits. Said Nutter: "Anyone who knows my record knows I attended every budget hearing this city has ever had during the time I was there, never missed a one. I don't remember seeing Tom Knox." At the firehouse, Brady said he wanted to establish a 311 phone system to siphon nonemergency calls from the city's 911 lines, and pledged to make better use of paramedics in firefighting units. Currently, Brady and firefighter union leaders say, 40 paramedics assigned to engine companies as firefighters are prohibited by regulations from using some of their advanced medical training. But the main point of Brady's news conference was to bring up the $70,000 fine Maryland regulators had imposed against Knox's Maryland Fidelity Insurance in 2002 for various violations, including telling customers they needed medical approval before visiting emergency rooms or in-network urgent care centers. "We're not going to stand for that in the city of Philadelphia," Brady said. Afterward, when asked about that, he acknowledged he had no proof that Knox wanted to institute such restrictions for city EMS responses. Knox's campaign aide, Morrow, said the Fidelity firm's instructions about emergency room visits had been posted by mistake and didn't reflect company policy. Morrow also said Knox had a 40-year business record his opponents could not match. "These are guys who have spent their entire lives on the public payroll, and Tom is a guy who has actually gone out and done things," Morrow said. Inquirer staff writers Larry Eichel and Craig R. McCoy contributed to this article.